We’d love your help. Let us know what’s wrong with this preview of Marry Me at Willoughby Close by Kate Hewitt. Alice James has been a drifter her whole life, working her way through several foster homes before ending up in Wychwood-on-Lea, feeling anchorless and invisible. When a chance encounter leads to Alice accepting a position as a caretaker and companion to Lady Stokeley, she starts to feel as if she might finally be able to put down some roots and live the way other people do. Then, Lady Stokeley’s nephew, city banker Henry Trent, storms into Willoughby Manor, seeming to find fault with everything, including Alice. As the next in line to the manor and title, he threatens to upturn everything she’s started to build. But Henry is hiding his own secret fears and weaknesses, ones he's desperate for no one to discover. A surprising and inconvenient attraction that simmers between them leaves Alice feeling more confused than ever, and Henry torn between duty and desire, fear and love. To ask other readers questions about Marry Me at Willoughby Close, please sign up. Alice James hadn’t had the easiest start in life, moving from foster home to foster home, then ending up homeless, with nowhere and no one to turn to. She is shocked when she is given a lifeline by Ava Mitchell, a resident of Willoughby Close, who helps her get back on her feet, including sorting her out with a job. Alice’s new job is to help Lady Stokeley, the 86-year-old who owns Willoughby Manor. Unfortunately, Lady Stokeley had been diagnosed with terminal cancer, and had decided not to have t Alice James hadn’t had the easiest start in life, moving from foster home to foster home, then ending up homeless, with nowhere and no one to turn to. Alice’s new job is to help Lady Stokeley, the 86-year-old who owns Willoughby Manor. Unfortunately, Lady Stokeley had been diagnosed with terminal cancer, and had decided not to have treatment. Looking after Lady Stokeley is no problem, as she doesn’t want to be fussed over, however her antagonising nephew Henry Trent, wants Alice to do more than just bring his Aunt cups of tea. But Henry has met his match in Alice, and she isn’t afraid to speak her mind. This is the first book of the Willoughby Close series that I have read, so although Alice was new to the series, and the book mainly regarded her, I had missed the build up to the other characters. Never the less, I understood the book perfectly, and enjoyed every minute of it. Ms. Hewitt has written a delicate story surrounding the terminal diagnosis and the deterioration of a lovely, sweet, old lady, who might be dying but she doesn’t want any fuss, and doesn’t want to be treated like an invalid. The intricate characters have been beautifully created, and fit together perfectly. Alice and Henry both clearly like one another, but neither wanted to admit that they did. I mean an heir to the Manor house, and a working class girl from a broken background, what could they possibly have in common? The plot has you caring about the characters, and is richly imaginative. I found myself eager to discover what would happen to Alice, Henry, and of course, Lady Stokeley. Would Alice and Henry get together? Would Lady Stokeley’s ill-health see her leaving the fictional world? I needed to know. This is a story that invites you into the pages and keeps you interested, and fully committed, from beginning to end. The choice of what one reads at any certain time, I think, is that one NEEDS at the moment. Reading is so wonderful because (if you are lucky-- or as time goes by able to pick an author who writes the words that satisfy...) as a reader you can be transported to a place (a vacation), meet new people that you would love to know and interact with, live through the characters eyes situations either easy, nice or maybe even scary ones that make your pulse race. We can transport through time and live The choice of what one reads at any certain time, I think, is that one NEEDS at the moment. Reading is so wonderful because (if you are lucky-- or as time goes by able to pick an author who writes the words that satisfy...) as a reader you can be transported to a place (a vacation), meet new people that you would love to know and interact with, live through the characters eyes situations either easy, nice or maybe even scary ones that make your pulse race. We can transport through time and live a bit of history that we do not know enough of and want to or even live in worlds that are made up and has absolutely nothing to do with what we know is real. It all has to do with the talent of the author we have choosen and the way they pave the books we read. Kate Hewitt is one of the authors (for me) that makes reading a book seem like watching life turn out the way we wish ours would. Well, maybe not quite like that, but maybe more aware of the choices we make all the time, with a satifactory explaination of why. I'm brand new to Kate Hewitt's work, but I was given an ARC of this novel for an honest review. The writing is well done. Alice James is working as a caregiver for a sweet dying woman who lives alone in her manor. Henry Trent is a nephew who comes across as a bit hard-nosed when the reality is that he's never been valued or loved in the manner that he deserved. Alice can relate to this (to some degree) as she grew up in foster care and had bounced from home to home due to her mother's drug addict I'm brand new to Kate Hewitt's work, but I was given an ARC of this novel for an honest review. The writing is well done. Alice James is working as a caregiver for a sweet dying woman who lives alone in her manor. Henry Trent is a nephew who comes across as a bit hard-nosed when the reality is that he's never been valued or loved in the manner that he deserved. Alice can relate to this (to some degree) as she grew up in foster care and had bounced from home to home due to her mother's drug addiction. Two people from opposite worlds, but their own pasts provide some common ground--they both want to love and be loved. It took me a while to finally accept Lady Stokeley's fate and Henry Trent's turn over a new leaf, but nothing prepared me with the tears that run down my eyes after reading this book. Yes, I think this is the final book in the Willoughby Close series. And it was really good. I met Alice on the Ava's story in Kiss Me at Willoughby Close and had grown to like her and her simplicity. I was quite angered at Henry Trent though for coming off annoying and brusque and obnoxious. But in this last book, It took me a while to finally accept Lady Stokeley's fate and Henry Trent's turn over a new leaf, but nothing prepared me with the tears that run down my eyes after reading this book. Yes, I think this is the final book in the Willoughby Close series. And it was really good. I met Alice on the Ava's story in Kiss Me at Willoughby Close and had grown to like her and her simplicity. I was quite angered at Henry Trent though for coming off annoying and brusque and obnoxious. But in this last book, I finally understood his aloofness, his stiff personality and his awkwardness with other people. My heart was also heavy because of the cancer that was eating up Lady Stokeleys. Brings me back to my memories of my father who also suffered cancer and I enveloped in sadness and pain when he died. Among the five books in this series, I think I loved this last story best. Alice was such an affectionate and warm-hearted individual who was also forgiving even after everything that she'd been through. Fostered from one family to another during her childhood, Alice grew up without a real family to hold on to, except for a grandmother who died in her care. She's been devoted, caring and tough even at the most trying times. Henry was her exact opposite. He couldn't show his affections, he tend to over-analyze things and talk in complicated tones, making look boring, conventional and snobbish person. Born in wealth but lacked in familial comfort, he became rigid, angsty, always in control. Then he could also be so strong yet so fragile. Alice has never experienced what it's like to have stable home. When she was a child she lived with several foster families. She didn't get the chance to stay anywhere long enough to become part of something. When Alice suddenly becomes homeless, a woman she's met by chance, Ava, offers her a place to stay at her cottage in Willoughby Close. There Alice meets Lady Stokely, a proud and friendly old lady, who lives in the nearby manor. Lady Stokely is terminally ill and needs someone to stay with Alice has never experienced what it's like to have stable home. When she was a child she lived with several foster families. She didn't get the chance to stay anywhere long enough to become part of something. When Alice suddenly becomes homeless, a woman she's met by chance, Ava, offers her a place to stay at her cottage in Willoughby Close. There Alice meets Lady Stokely, a proud and friendly old lady, who lives in the nearby manor. Lady Stokely is terminally ill and needs someone to stay with her. Alice has a few nursing diplomas and has enough experience to take care of her. The job comes with a living accommodation and Alice finally has the idea she might have found a place where she belongs. When circumstances become even more difficult, both Alice and Henry must decide who they really are, and what they are willing to fight for. Could Alice possibly the next Lady of Willoughby Manor? I have absolutely loved this series and im so sad to see it end but we certainly go out with a bang. Focusing on the newest resident of Willoughby Close, Alice James who takes the job to look after Lady Stokeley. Add into the mix Lady Stokeley's nephew Henry Trent, most people dont like him but we soon find out Alice has taken a bit of a shine to him. Will there be a happily ever after?. I love spending time at Willoughby Close! (Insert sigh here!) This visit brought Alice into the spotlight, caring for Dorothy (Lady Stokely) as she faced her final days, having decided to cease treatment for her cancer. We also get better acquainted with Dorothy's nephew, the Honorable Henry Trent, who heretofore has been presented as quite the young, rude, curmudgeon. Alice and Henry come from wildly different backgrounds and it is lovely to get to know them and to watch Dorothy's skill at seei I love spending time at Willoughby Close! (Insert sigh here!) This visit brought Alice into the spotlight, caring for Dorothy (Lady Stokely) as she faced her final days, having decided to cease treatment for her cancer. We also get better acquainted with Dorothy's nephew, the Honorable Henry Trent, who heretofore has been presented as quite the young, rude, curmudgeon. Alice and Henry come from wildly different backgrounds and it is lovely to get to know them and to watch Dorothy's skill at seeing beneath a person's surface to what lies at the heart of the matter. And her matchmaking skills are well polished, as well! This book includes the residents of Willoughby Close whom we met in the previous books. As always, I enjoyed watching them come together to make life better for each other. If you haven't read these books yet, I recommend you give yourself a holiday and take a trip to Willoughby Close. I thoroughly enjoyed the conclusion of The Willoughby Close series. I don't think it could have ended any better than it did. Henry Trent came across as mean and uncaring throughout the series. I was happy to find out more about him and hear why he seemed so mean, guarded and didn't want anyone to get close to him. Alice James was the perfect companion and caretaker for Lady Stokeley. Having been brought up in the foster system, Alice didn't have much and never experience real love or friendship. I thoroughly enjoyed the conclusion of The Willoughby Close series. I don't think it could have ended any better than it did. Alice James was the perfect companion and caretaker for Lady Stokeley. Having been brought up in the foster system, Alice didn't have much and never experience real love or friendship. The friends she made at Willoughby Close, with Lady Stokeley and Henry were priceless and helped her realize she was worthy of love. If you haven't read this series yet, you will want to start book one to learn about Lady Stokeley as her story runs throughout the series. The rest of the stories are concluded at the end of each book. The author did a wonderful job with this series. Kate Hewitt puts her heart on full display with every character she creates and each tale she writes. The pain is real, the emotions are humanizing and the journey is cathartic. Alice is finding her way after years of uncertainty. She's searching for a place to belong. Will she find it at Willoughby Manor? Welcome to today's celebration of Kate Hewitt's latest book, Marry Me at Willoughby Close. There is also the chance to win an Amazon Giftcard today, with details at the end of this post. Alice James has been a drifter her whole life, working her way through several foster homes before ending up in Wychwood-on-Lea..., feeling anchorless and invisible. When a chance encounter leads to Alice accepting a position as a caretaker and companion to Lady Stokeley, she starts to feel as if she might finally be able to put down some roots and live the way other people do. Then, Lady Stokely's nephew, city banker Henry Trent, storms into Willoughby Manor, seeming to find fault with everything, including Alice. As the next in line to the manor and title, he threatens to upturn everything she's started to build. But Henry is hiding his own secret fears and weaknesses, ones he's desperate for no one to discover. A surprising and inconvenient attraction that simmers between them leaves Alice feeling more confused than ever, and Henry torn between duty and desire, fear and love. When circumstances become even more difficult, both Alice and Henry must decide who they really are, and what they are willing to fight for. Could Alice possibly be the next Lady of Willoughby Manor? I have enjoyed meeting the inhabitants of Willoughby Close but found the final episode a bit bitter-sweet. I have particularly enjoyed meeting each new member of the Close. My over-riding pleasure this time out was to meet Lady Stokeley and to sense her pleasure as she sized up the opposition. She is a great character- full of realism, cynicism and good old fashioned common sense. I particularly found the character of Henry to be intriguing. As you find out more about his past, you discover that he has much in common with Alice and has hidden depths. All though he may appear to be the stereo-typical hero, he is in fact more nuanced than that, with much more to say. The real star of the show is the Manor itself, which gives the backdrop to the final Ball Scene. It roots the characters to the story , the centre-pin of the whole series of books. I will miss the characters and have admired how the baton has been passed from each person as each book has started. In short: escapist romance with a touch of vinegar. Alice James has become a caregiver for Lady Dorothy Stokley. Lady Stokley has terminal cancer and her nephew, Henry Trent, believes that she must no longer live alone. Alice is a former foster child whose young life has been colored by a lack of family and friends. She has survived and thrived in her life by sheer will. When she first goes into the Manor house, she is intimidated by Lady Stokley. But, eventually they come to an understanding. Lady Stokley's bark is worse than her bite and she is Alice James has become a caregiver for Lady Dorothy Stokley. Lady Stokley has terminal cancer and her nephew, Henry Trent, believes that she must no longer live alone. Alice is a former foster child whose young life has been colored by a lack of family and friends. She has survived and thrived in her life by sheer will. When she first goes into the Manor house, she is intimidated by Lady Stokley. But, eventually they come to an understanding. Lady Stokley's bark is worse than her bite and she is basically a lovely woman facing a terrible time in her life. Henry on the other hand is not such a nice guy. He is a snob who automatically looks at everything through a filter of “I am always right”. He has had a life with no family and few friends. His privileged parents have never had an interest in Henry. So, Henry has grown into a man who does not show emotions nor does he have much of a connection to his fellow man. This is the final chapter in a series that I have just loved. Willoughby Close is a place where people have come and found out who they are. It has been nearly a magical group of homes. Individuals and families have found a warm and welcoming place and the time to find solutions to problems. If I were the kind of person who believed in such things, I would say that Lady Stokley's good heart has provided the atmosphere for such a place. Alice looks around the Manor and sees a place that has been neglected for a long time. She cannot allow that to continue so she starts cleaning and caring for the house. At the same time, she shows Lady Stokley that she is cared for too. Letting light into a grey place can do wonders for that place. The longer Henry sees Alice, the more he is drawn to her goodness and her caring nature. But, it is very difficult for him to figure out how to relate to those qualities. He does not even recognize the feelings he is having for her. Ms Hewitt has created a wonderful series. She writes of people who are actual human beings with flaws as well as perfections. She has created a location filled with a generosity of spirit and a sense of love. There is romantic love, love of family and love of others who need it. I have enjoyed this series very much. Each story has provided me with a wonderful reading experience. Thank you Ms Hewitt. Then, Lady Stokeley’s nephew, city banker Henry Trent, storms into Willoughby Manor, seeming to find fault with everything, including Alice. As the next in line to the manor and title, he threatens to upturn everything she’s started to build. But Henry is hiding his own secret fears and weaknesses, ones he’s desperate for no one to discover. A surprising and inconvenient attraction that simmers between them leaves Alice feeling more confused than ever, and Henry torn between duty and desire, fear and love. this is Alice James and Henry Trent's story. Alice stepped into the dim, draughty foyer of Willoughby Manor, blinking in the dusty, musty gloom. Today was the first day of her new job, and she was feeling both anxious and excited in equal measure. “Henry wishes to meet you,” Lady Stokeley continued, and thoughts of Ava and accommodation fell away in light of this surprising and unwelcome news. “He does?” Alice supposed it was to be expected, considering Henry Trent was responsible for his aunt’s welfare, and the heir to the title, Earl of Stokeley. Could Alice possibly be the next Lady of Willoughby Manor? read this book to find out. Marry Me at Willoughby Close by Kate Hewitt is a 4 star book. After years of struggling things are finally looking up for Alice. She knows what it's like to be unwanted, but things are about to change now that she's met Ava. Ava has recently moved into cottage number 3 at Willoughby Close and understands the difficulties of having to start over with nothing but the clothes on your back. Alice isn't used to kindness, but has a connection with Ava from the beginning. Alice wants to be a nurse and has already got some qualifications. Lady Stokely, who lives i After years of struggling things are finally looking up for Alice. She knows what it's like to be unwanted, but things are about to change now that she's met Ava. Ava has recently moved into cottage number 3 at Willoughby Close and understands the difficulties of having to start over with nothing but the clothes on your back. Alice isn't used to kindness, but has a connection with Ava from the beginning. Alice wants to be a nurse and has already got some qualifications. Lady Stokely, who lives in the manor close to Willoughby Close, needs someone to take care of her, which would be an ideal job for Alice. Lady Stokely hires the young woman and gives her a place to stay. Does Lady Stokely's nephew Henry, who's looking after his aunt whenever he has the time, agree with this decision? Will her stay at Willoughby Close bring Alice the happy ending she so desperately seeks? This review originally appeared on BrizzleLass Books. It’s always bittersweet when you reach the end of a series you’ve enjoyed. There’s the comfort with Kate Hewitt that she’ll have something else up her sleeve to replace the loss but knowing you won’t be spending anymore time with these characters you’ve come to love is quite sad. The great thing about this book is that Kate Hewitt most definitely saved the best for last. This book was everything I look for in this genre, witty, funny, sad, and This review originally appeared on BrizzleLass Books. The great thing about this book is that Kate Hewitt most definitely saved the best for last. This book was everything I look for in this genre, witty, funny, sad, and lovable, with that guaranteed happily ever after. Lady Stokeley has hired Alice who we met briefly in Kiss Me At Willoughby Close. Alice will work as Lady Stokeley’s companion and ensure she is cared for as her cancer progresses. Of course Henry Trent, Lady Stokeley’s nephew isn’t so sure Alice is qualified and starts poking his rather posh nose into affairs. It became apparent to me early on that Lady Stokeley had alterior motives to most of what she said and did and despite being sick she was completely devious and hilarious. Alice was wonderful, not one to take Henry’s bully boy tactics, she stood up to him from the start, questioning him and finding a sassy side to herself I don’t think even she knew she had. Because of that she intrigued him and they developed a friendship and got to know each other, the book could only work out the way it did because of the way she found herself in those early pages. Henry is someone I felt is always misunderstood, from a wealthy aristocratic family people make a lot of assumptions about him. He likes that Alice treats him like a normal person and just make assumptions. There’s a lot of depth to Henry, beyond the grump that we’ve seen in the previous books and uncovering that character in this book was wonderful. I particularly loved his relationship with his Aunt which was very special. This was a thoroughly enjoyable read and if you’re only going to read one book from the Willoughby Close series then it has to be this one. The fifth and final Willoughby Close book closes the whole series out in style. Like the other books, it features a heroine who has been through a lot and who finds strength, friendship and even love within the small but increasingly tight-knit community of the close. We also finally get to know Lady Stokely’s mysterious nephew and learn a little bit more about Lady Stokely’s own feelings. I really enjoyed this. Alice is a great character. She might only be twenty-two, but she’s been through a lo The fifth and final Willoughby Close book closes the whole series out in style. Like the other books, it features a heroine who has been through a lot and who finds strength, friendship and even love within the small but increasingly tight-knit community of the close. We also finally get to know Lady Stokely’s mysterious nephew and learn a little bit more about Lady Stokely’s own feelings. I really enjoyed this. Alice is a great character. She might only be twenty-two, but she’s been through a lot in her short life and had to fight for everything she has. I loved how she grew in strength throughout the story, starting off pretty meek and mild, but gaining confidence as everything progressed. She’s kind and caring and incredibly forgiving, but that doesn’t mean she’s a doormat. I think I loved the relationship she builds with Lady Stokely/Dorothy even more than the one with Henry. Not that I didn’t like Henry, but he’s quite stiff and very proper and hard to read. For Alice, anyway. It’s fairly obvious at times that he feels something for her – even if she doesn’t realise it – but he’s also constrained by the large age gap between them and other social restrictions. He changes too as the book progresses, and I did wish at times we had some of his POV to see what was really going on inside his head. The romance itself is very slow going and sweet. There’s a lot going on in this book – emotionally – so there isn’t always time for Alice and Henry to explore their feelings. But the romance is there, subtly, and given the huge differences between the two of them, I liked that it took time to grow and progress. But beyond the romance, and almost more important than it, is Lady Stokely. Dorothy’s presence has been steadily increasing through the previous books and she plays an important and prominent part in this one. I loved how she and Alice came to an understanding, not to mention the return of her fairy godmother role. It is all rather tinged with melancholy, thanks to Dorothy’s illness, but it was great to see she still had her spirit and independence. She’s a wonderful character and it was lovely to finally know her better. In all, this was a fine and fitting end to this series of love, friendship and life-changing moments. I’ll be interested to see what the author comes up with next. Alice James has drifted all her life, from one foster home to another, with no real roots anywhere. After having to leave the last place because she aged out of the system, Alice befriends Ava and ends up in Wychwood-on-Lea—but she still has no roots and continues to be listless and drifting. Finally, with Ava’s help, she lands a job as a companion to Lady Stokeley, and older woman dying of terminal cancer, who see no reason to continue any treatments for her illness and who just wants to end th Alice James has drifted all her life, from one foster home to another, with no real roots anywhere. After having to leave the last place because she aged out of the system, Alice befriends Ava and ends up in Wychwood-on-Lea—but she still has no roots and continues to be listless and drifting. Finally, with Ava’s help, she lands a job as a companion to Lady Stokeley, and older woman dying of terminal cancer, who see no reason to continue any treatments for her illness and who just wants to end things peacefully at home. Alice is intimidated by the job and household, but figures this is one place she may be able to get her life on track and establish some roots, so determines to give it her best effort. Lady Stokeley is a wonderful older woman, nice as can be, who demands very little of Alice. However, she has a nephew, Henry, who thinks he can make all his aunt’s decisions and who is very demanding an employer, not to mention being gruff and brisk. However, Alice is not intimidated by him. Together, they work out a plan for her to continue on at the manor, despite an uncomfortable attraction between them that leaves Alice as confused as ever and Henry torn between what he feels is his duty and right and where he sees himself going. This is a romance with a little bit different a twist. The two main characters, Alice and Henry, are about as unlike as any two can be and they come from very different backgrounds and lives. Still, the author has managed to bring them together in an absolutely magnificent way. Each as a past they need to accept, complete with experiences, lessons and secrets, some of which get in the way. Still, they manage to work through things. The book is a fairly good testament to how love can exist and flourish between two persons, even if all signs point to it being something impossible. I particularly enjoyed the character Lady Stokeley, since I found her to be a genuinely wonderful person, graceful even in death. The characters blend in quite well in the story. I have not read the other books in the series, but they will be on my shelf after reading this one. I received this from NetGalley to read and review. First of all I have to mention that this book is part of a series however I would still class it as being able to be read as a standalone. Characters from the previous books are mentioned but it all feels natural as their backgrounds are introduced. I loved the strong connections that everyone shares at Willoughby Close. It's lovely to see all of the friendships that have been formed and how everyone rallies around Alice. You can feel Alice's emotions as this is the first time I guess that she h First of all I have to mention that this book is part of a series however I would still class it as being able to be read as a standalone. Characters from the previous books are mentioned but it all feels natural as their backgrounds are introduced. I loved the strong connections that everyone shares at Willoughby Close. It's lovely to see all of the friendships that have been formed and how everyone rallies around Alice. You can feel Alice's emotions as this is the first time I guess that she has felt as if she belonged. There were definitely a couple of moments where I felt the emotion of the story and I may have had a few tears in my eyes. Alice is a wonderful character and I couldn't help but feel a pull towards her character. Henry is a mystery to start with as he doesn't reveal much so it was great that as the story moves along more layers of his personality are revealed. The story moves fairly quickly and it was just so easy to sit back and enjoy the lovely story as it unfolded. With a set of delightful characters who made the story even more engaging for me. All the way through it gave off an almost fairy tale vibe mainly because Alice has had such a tough life and then all of a sudden life seems to be more rosy and the outlook more positive. Then with the added extra of romance it really makes a heart warming story come to life. It was very easy to be charmed by this story and I was left feeling that Willoughby Close would be an ideal place to live. Heart warming with a wonderful romance! With thanks to Jenny at Neverland Blog Tours for my copy. This is my honest and unbiased opinion. Except for the few innuendos and few swear words (which were very subtle and easily forgettable), the rest was perfect! The ending did not feel cliched and left me feeling that perfect “awww” feeling and the bubbly giddiness of a perfect story. I did realize this was the end of a 5-book series. I read it as a stand-alone and had no problem understanding the characters or plot. The British flavor was a little hard for this American to get into at first; especially the abbreviations that I had abso Except for the few innuendos and few swear words (which were very subtle and easily forgettable), the rest was perfect! The ending did not feel cliched and left me feeling that perfect “awww” feeling and the bubbly giddiness of a perfect story. I did realize this was the end of a 5-book series. I read it as a stand-alone and had no problem understanding the characters or plot. The British flavor was a little hard for this American to get into at first; especially the abbreviations that I had absolutely no clue about for several chapters but eventually had to assume from context. I did enjoy getting to know a little more about contemporary British culture, mixed in with allusions to the Regency era I'm more familiar with, being a huge Jane Austen fan. I loved the depth of characters, which is the most important thing to me in a story! The growth was realistic, two steps forward, one step back, just like in real life. But it was beautiful to be a part of. I loved it! “Perhaps that was what love was—loving the whole person, flaws and faults included. Loving with one's eyes open, rather than the emotion being blind” (p.108). “'Alice? Ava broke into her thoughts. 'Why are you suddenly looking like the cat who ate all the cream?' Alice blinked the world back into focus. 'Am I?' she said, and, of course, blushed. 'No reason. She rose from the table and reached for her mop and pail. 'No reason at all. '“ (p. 135). Having read and loved other books in this charming series, this one is the most bitter-sweet. You may want to keep tissues nearby. The residents of Willoughby Close look out for each other. Their landlady is an actual Lady, royalty. She is an elderly recluse who lives in the Manor and stays seemingly much to herself. If you have read previous books in the series you know that she has become special to each of the residents. Alice James is the most recent lost soul to find her way to Willoughby Close Having read and loved other books in this charming series, this one is the most bitter-sweet. Alice James is the most recent lost soul to find her way to Willoughby Close. She has been independent most of her life, more often being the one to care for others than being cared for. As tough as life has been, she is still sweet and a bit naive. She thinks her new job is to care for the aged and ailing Lady Stokeley, but quickly comes to accept that the Lady is not ready to be waited upon. The other main character and lost soul at the heart of this novel is Lady Stokeley's semi absent nephew, Henry Trent. Most of the residents consider Henry cold, brusk and indifferent when not outright rude. Alice instinctively sees beneath this facade. The relationship between Alice and each member of the Trent family has its ups and downs. There are times when she doubts herself, her future, and her choices. Most of all, she struggles to come to terms with her feelings about Henry. I feel you might enjoy this book best if you have read at least one prior in the series but it can stand alone. The characters are endearing, the environment charming. It is a mixture of old world and modern circumstances. Kindhearted Alice has come from a troubled background, being pushed from one foster home to another, eventually being in the care of social services till she was too old to stay. Her education has been patchy and because she now doesn't have a home she is unable to continue with her NVQ course. Ava Mitchell rescued Alice from the streets, sharing her home and getting a CV in order and finally helping her to get the position of companion/health care assistant to Dorothy, Lady Stokely, a cancer pa Kindhearted Alice has come from a troubled background, being pushed from one foster home to another, eventually being in the care of social services till she was too old to stay. Her education has been patchy and because she now doesn't have a home she is unable to continue with her NVQ course. Ava Mitchell rescued Alice from the streets, sharing her home and getting a CV in order and finally helping her to get the position of companion/health care assistant to Dorothy, Lady Stokely, a cancer patient who has refused to have more treatment, preferring to spend her final days at the manor house. Alice and Dorothy have unusual understanding/working relationship which in time becomes friendship. Henry Trent is Lady Stokely's nephew, the only other visitor that Dorothy sees other than the neighbours in Willoughby Close. Henry is hard, abrupt and stand offish to everyone, but has a hidden love of his aunt. Henry has also had a troubled upbringing which shares many differences and some comparisons with Alice. Henry and Alice attempt to make Dorothy's last few months as easy as possible, holding a ball at the manor house where Lady Stokely collapses. Through out their time together, Henry and Alice start to have feelings for each other, but both are in denial about them. The covers in the Willoughby Close series make them seem as if they will be light reads, but they are very misleading. This book includes a romance, but there are plenty of sad moments, too, given that the story revolves around a woman dying from cancer. Alice is a very sympathetic main character. She’s kind and good-hearted, even though she’s had a rough life in and out of foster homes as a child, as well as having nursed her grandmother through her final illness. She desperately wants to feel l The covers in the Willoughby Close series make them seem as if they will be light reads, but they are very misleading. This book includes a romance, but there are plenty of sad moments, too, given that the story revolves around a woman dying from cancer. Alice is a very sympathetic main character. She’s kind and good-hearted, even though she’s had a rough life in and out of foster homes as a child, as well as having nursed her grandmother through her final illness. She desperately wants to feel like she has a home and connections to other people. As she cares for the dying Lady Stokely, Alice slowly finds everything she’s been looking for—a place that feels like home, friends, and even a man she loves. Her love interest, Henry, Lady Stokely’s nephew, is less likeable at first. He seems snobbish, rude, and demanding. The reader eventually learns, though, that Henry’s emotional growth has been stunted by his parents’ neglect. Reading about him slowly realizing his true feelings for Alice was just as satisfying as the emotional arc of Alice’s journey. One especially good aspect of the book was the way Lady Stokely’s illness and death were treated. Lady Stokely is a well-rounded character, and the reader learns enough about her to make her death moving. Her illness isn’t just a plot point to bring the two main characters together. Readers looking for a romance who don’t mind a story that touches on some darker themes should give this book a try. This is the final book in the Willoughby Close set which began with A Cotswold Christmas. It is such a lovely book filled with lovely emotion and sentiment. It might be my favorite of all of them. This is the story of Alice and Henry and of Lady Willoughby. Henry has been mentioned in the other books and without much to like about him. He comes off as gruff, stuck up and downright mean to the other renters in Willoughby Close. He is the unfeeling nephew to Lady Willoughby or so everyone thinks. Al This is the final book in the Willoughby Close set which began with A Cotswold Christmas. It is such a lovely book filled with lovely emotion and sentiment. It might be my favorite of all of them. Alice was introduced in book 4, Kiss Me at Willoughby Close, as a down-on-her luck young woman in need of work and a home. She is lucky to come into the job of caring for the ailing Lady, who doesn’t want to lose her last shred of independence. Alice meets the stodgy, gruff Henry when he comes to his aunt’s home to visit. He was under the impression that Alice was a matronly woman not a young girl. Alice and Henry develop an uneasy relationship but their love for Lady Willoughby draws them together. Alice dreams about Henry but he is closed off, then close, then closed off again. Not until the very end do you learn if Henry can or will admit he feels for Alice. Even she does not know. Alice James has had a tough life. A chance meeting with Ava Miller has given her the chance to finally get her life started, especially when it leads to a job with Lady Stokely. The only hurdle is Henry Trent, Lady Stokely's uptight nephew, who has not made a good impression on any of the tenants. When Alice stands up for herself and earns the opportunity to prove herself, she and Henry spend more and more time together. As the two grow closer, can Alice find a way to convince Henry that she is Alice James has had a tough life. A chance meeting with Ava Miller has given her the chance to finally get her life started, especially when it leads to a job with Lady Stokely. The only hurdle is Henry Trent, Lady Stokely's uptight nephew, who has not made a good impression on any of the tenants. When Alice stands up for herself and earns the opportunity to prove herself, she and Henry spend more and more time together. As the two grow closer, can Alice find a way to convince Henry that she is the one he needs? For me, this was a bittersweet ending to the series. It was well-written story with fully-realized characters and a satisfying and emotional ending. I just hate to see the series end. As with the other stories, there is more than just romance: It's about a place people find second chances and friends that become their family of choice. Alice finds not only a home, but friends she didn't know she needed. 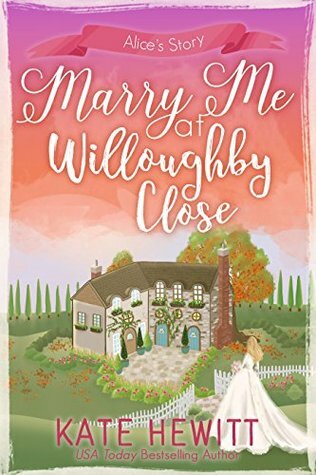 I totally enjoyed Marry Me at Willoughby Close by Kate Hewitt, book five in her Willoughby Close series. Alice James has flitted through life after moving through several foster homes. Somehow she ends up in Wynchwood-on-Lea where she is befriended by the residents of Willoughby Close. Accepting a position as a caretaker and companion to the dying Lady Stokely, Alice finally believes she could put down roots like other people. Henry Trent, Lady Stokely’s nephew has not known much happiness in hi I totally enjoyed Marry Me at Willoughby Close by Kate Hewitt, book five in her Willoughby Close series. Alice James has flitted through life after moving through several foster homes. Somehow she ends up in Wynchwood-on-Lea where she is befriended by the residents of Willoughby Close. Accepting a position as a caretaker and companion to the dying Lady Stokely, Alice finally believes she could put down roots like other people. Henry Trent, Lady Stokely’s nephew has not known much happiness in his life. Alice and Lady Stokely work together to change that. As Henry gets to know Alice better maybe he can find some happiness and love. I loved reading this book and had trouble putting this book down, reading it in one day. Ms. Hewitt drew me in and did not let go until I read the last page. I highly recommend this book to other readers. Cinderella, eat your heart out because Alice James has taken centre stage at Willoughby Close and what a rags to riches story she has lived! It is hard to imagine a more unlikely couple than timid Alice James and Lady Stokeley's nephew the aloof and stand-offish Henry Trent. Despite a clear attraction between these two, a happy ever after appears impossible at times. Kate Hewitt's characters are always beautifully rounded and tat is certainly the case with Marry Me At Willoughby Close. It's not j Cinderella, eat your heart out because Alice James has taken centre stage at Willoughby Close and what a rags to riches story she has lived! It is hard to imagine a more unlikely couple than timid Alice James and Lady Stokeley's nephew the aloof and stand-offish Henry Trent. Despite a clear attraction between these two, a happy ever after appears impossible at times. This is Alice James and Henry Trent's story. It is also continuation of Lady Stokeley's story and the final book in this series. Alice's life has been a struggle for her. She longs for love and to feel wanted. Alice wants to be living life not feeling like she isn't good enough. Henry was raised with everything money could buy but also longs to be loved. He comes across as gruff and mean. Is this Henry's way of protecting his heart? Alice is taking care of Henry's aunt which puts Henry and Alice spending time together. They both are attracted to one another but come from different worlds. Will they let their defenses down in order to take a chance on love? This is a sweet and clean story that is emotional and heartwarming. I enjoyed Alice and Henry's story. Kate Hewitt ‘s Willoughby Close Series always makes me feel as if I have taken a mini-vacation to the British Isles. Marry Me at Willoughby Close has us at the big manor. Oh, boy! Lady Stokeley was a major supporting character in the first book of this series so I was thrilled to see more about her and her nephew in this story. Alice James and Henry Trent are well matched in this story. As always, the characters find that if they dig deep inside they will find a way not to just survive but to li Kate Hewitt ‘s Willoughby Close Series always makes me feel as if I have taken a mini-vacation to the British Isles. Marry Me at Willoughby Close has us at the big manor. Oh, boy! Lady Stokeley was a major supporting character in the first book of this series so I was thrilled to see more about her and her nephew in this story. Alice James and Henry Trent are well matched in this story. As always, the characters find that if they dig deep inside they will find a way not to just survive but to live graciously. That is how I think of Lady Stokeley, her legacy so to speak. The cottages at Willoughby Close seem to have a bit of magic as people find direction, strength and love in them. So it is time for the magic to be at the manor too. It is a wonderful story to savor. This is the BEST of the Willoughby Close novels — light, fun, witty, believable. Loved Alice’s story, including her realistic fears about feeling settled after being a drifter for so long, and her reactions to handsome-but-snobby Henry. Alice was the perfect companion to elderly and frail Lady Stokely, unobtrusive and kind. I liked the cameos by the Willoughby Close neighbors from previous books in the series, and Hewitt did a fabulous job having them stay true to themselves — as did Alice, even This is the BEST of the Willoughby Close novels — light, fun, witty, believable. Loved Alice’s story, including her realistic fears about feeling settled after being a drifter for so long, and her reactions to handsome-but-snobby Henry. Alice was the perfect companion to elderly and frail Lady Stokely, unobtrusive and kind. I liked the cameos by the Willoughby Close neighbors from previous books in the series, and Hewitt did a fabulous job having them stay true to themselves — as did Alice, even when she fell in love. This is one of my favorite summer British chick lit reads, but you might want to prep by reading book 1 first. Netgalley provided an advance copy in exchange for an honest review. Kate is the USA Today-bsetselling author of many books of women's fiction. Her latest releases are A Vicarage Homecoming and Not My Daughter. Under the name Katharine Swartz, she is the author of the Tales from Goswell books, a series of time-slip novels set in the village of Goswell. She likes to read women's fiction, mystery and thrillers, as well as historical novels. She particularly enjoys re Kate is the USA Today-bsetselling author of many books of women's fiction. Her latest releases are A Vicarage Homecoming and Not My Daughter. Under the name Katharine Swartz, she is the author of the Tales from Goswell books, a series of time-slip novels set in the village of Goswell. She likes to read women's fiction, mystery and thrillers, as well as historical novels. She particularly enjoys reading about well-drawn characters and avoids high-concept plots.